Fostex Model 280 Multitracker. Comes with free US to U.K. plug converter. Condition is Used but I’m very good condition. 2 tiny buttons are missing but they are easy to press still. Dispatched with Royal Mail 2nd Class. Fostex VM 88 Digital mixer very rare, in working conditions. With internal effects and ADAT Lightpipe IN and OUT for expanding sound cards and serving as a Analog to Digital converter and have 8 extra inputs. Fostex DMT-8VL Digital Multitrack Recorder. Condition is Used. Dispatched with Royal Mail 1st Class. Fostex VF 160 16/24 Track Digital Multitrack Recorder - Hard Disk, SCSI & CD-RW. Great condition in box with manual. The analog mixer has a two-band equalizer on each of the eight channels and two auxiliary sends. There are direct inputs and outputs and independent monitor outputs. The unit has a digital output port for mixing directly to DAT in digital domain. USED FOSTEX FR-2LE CF FIELD RECORDER . FOSTEX MODEL FR-2LE FIELD RECORDER SERIAL NUMBER 0963748 MADE IN CHINA. Used but works as it should and looks pretty good. The unit does have various scratches mainly on the underside near the serial number. Bought in early 1990s and never used - I used an Opcode SMPTE unit for striping tapes so this has sat in a drawer since I bought it. Any item that is not photographed will not be included. Opening Hours. Digital Projectors. If there is an issue with your item and you believe it to be faulty we will help you as quickly as possible. Light use, excellent hard disk recorder for studio, live backing track, or taking desk recordings. Comes with extension cable to detach controller from unit, and in a 4U hard flight case. Here we have for sale the much better, newer and sought after Fostex D2424LV fitted with a single 120Gb Western Digital Hard Drive. FOSTEX FD-4 DIGITAL MULTITRACKER PLUS ZIP DRIVE AND DISKS. Condition is Used. Dispatched with Royal Mail 2nd Class. All boards fully tested on my G16s. 16 x Cards. one capacitor has been replaced with a Film capacitor. so if your boards are in less than good condition or you are unsure. I am a qualified electronics engineer with many years experience in electronic repair. Fostex DC-R302 Professional 3 Channel Portable Audio Mixer Recorder Brand New!! Located in the UK no hidden costs or import duty etc. Many DSLRs can now capture HD video, many also have microphone inputs. Enter the new Fostex DC-R302. The DC-R302 is a professional stereo recorder with on-board 3-ch pre-amp audio microphone / line mixer designed for use with video-capable DSLRs. Good condition as pictured (price per single remote). Much sought after FOSTEX D2424LV HD RECORDER 2 X HardDrives , 120GB 160 GB . Supports rec / play up to 24t simultaneously via Adat , optical I/O or 24 analogue line ins / outs. Fully tested and working perfectly , no marks on case , removable front panel like new. Original manuals . I also have the patch bay i used with this for sale , 2 x vintage bantam switchcraft wired with 120 pin Edac plugs on multicore to stereo jacks .See sellers other items . Thanks for looking. Fostex VF-160. Marke Fostex. Produktart Digitaler Recorder. Each channel has a 3 band EQ, effect/aux send. The Restringsr takes in uncompressed CD quality (16-bit, 44.1 kHz on) on. 16 gauge Digitalrestringsr. , start to finish. THE CD RECORDING UNIT UNFORTUNATLY, IS NOT WITH THE FULL RACK SYSTEM. FROM HIS MAD DOG RECORDING STUDIOS IN LA CALIFORNIA. The foster mixing desk cost an absolute arm/ leg; few years ago only. Spare Parts - Fostex. An LTC offset can be set independently for each file. Load Impedance: 600 ohm or more. Input Level: 0.25Vp-p. Level: 5V (470 ohm) or 24V (2k ohm) switchable. Rated Output Level: TTL Level. Than those cheap "Quantum Fireballs" that Fostex originally used in their recorders. And also included on this hard drive is the original Fostex VF-8 series "factory demo song ". HUGE 120 GB internal hard drive. Video Sound Mixer/Recorder FOSTEX DC-R302 ...New, Unused in Box. That requires so much ink and paper, that it would cost more than this manual. Price includes one manual. These manuals are not new, but they are in good condition. I have acquired them through the years. Works in Fostex VF80, VF80EX, VF160 and VF160EX recorders. If you are purchasing this for a Fostex VF160 recorder, it must have. Based on test results with a VF160 recorder. This CD-RW, also known as the CD1A, was made for Fostex VF80, VF80EX, VF160 and VF160EX. Than those cheap "Quantum Fireballs" that Fostex originally used in their recorders. This 40 GB internal hard drive is specially formulated for Fostex VF series. And also included on this hard drive is the original Fostex VF-16 series "factory demo song ". Than those cheap "Quantum Fireballs" that Fostex originally used in their recorders. This 60 GB internal hard drive is specially formulated for Fostex VF series. And also included on this hard drive is the original Fostex VF-16 series "factory demo song ". Than those cheap "Quantum Fireballs" that Fostex originally used in their recorders. And also included on this hard drive is the original Fostex VF-8 series "factory demo song ". HUGE 12 0 GB internal hard drive. Than those cheap "Quantum Fireballs" that Fostex originally used in their recorders. And also included on this hard drive is the original Fostex VF-8 series "factory demo song ". HUGE 10 0 GB internal hard drive. Than those cheap "Quantum Fireballs" that Fostex originally used in their recorders. And also included on this hard drive is the original Fostex VF-8 series "factory demo song ". HUGE 80 GB internal hard drive. Than those cheap "Quantum Fireballs" that Fostex originally used in their recorders. And also included on this hard drive is the original Fostex VF-8 series "factory demo song ". HUGE 40 GB internal hard drive. Works in Fostex VF80, VF80EX, VF160 and VF160EX recorders. 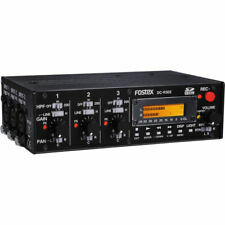 If you are purchasing this for a Fostex VF160 recorder, it must have. Based on test results with a VF160 recorder. when using a VF160 with software lower than version 2.03. Tape Speed: 9.5 cm/s. Tape Type: CrO2. Frequency Response: 40Hz to 18kHz (Cr02 tape). Briefly power tested ONLY. This item powers on and the power light shines. Due to the nature of the item we are unable to test item any further. For sale is my Fostex D25 DAT recorder. Was perfectly ok couple of years ago, now the draw won’t open. Have used it recently as A to D converter. FAULTY - Fostex MR-16 HD Digital Multi-track Recorder MR16 This is a faulty unit. Only powers up to an illuminated screen for couple of seconds and then goes off. Please refer to the photos. One of the knobs cap is missing as seen in the photo. Only comes with power cable and sold as faulty for repair or spares only. Than those cheap "Quantum Fireballs" that Fostex originally used in their recorders. This 120 GB internal hard drive is specially formulated for Fostex VF series. And also included on this hard drive is the original Fostex VF-16 series "factory demo song ".